Emmy Award-winner Howard Kleinfeld’s humorous debut novel explores the wine experience. A new book getting rave reviews from wine aficionados, “Dial M for Merlot” casts the wine experience and lifestyle as a central character in a dramedy/mystery. The debut novel by wine enthusiast and music producer Howard Kleinfeld (pen name, Howard K), “Dial M” is described as a “wine-based magical romp” by reviewer Peter F. May of BellaOnline. “The main message of the book is to take a chance – say ‘yes’ to new adventures and enjoy the marvel of the moment,’’ says Kleinfeld, an Emmy Award-winner who composes and produces music for TV shows and for corporate marketing for clients including McDonald’s and Sonny’s restaurants, Office Depot and HBO Sports, among others. “Dial M’s” main character is Justin James, a 30-year-old math wiz whose social life consists of Comic Cons and Star Trek conventions. He’s an awkward loner whose attempts at dating fall flat despite his best efforts. On a rainy, dismal night, after being stood up yet again, he happens past a wine shop with a tasting in full tilt. A friendly stranger pulls him in out of the wet and gives him his first glass of wine. Thus begins a personal journey of growth amidst a cast of memorable characters, not the least of which is the burgeoning wine experience subculture. The plot roams from storefront wine shops in Orlando, Fla., to a troll-like malevolent vintner in France’s Bordeaux region, where Justin and his new pals are caught up in some colorful wine intrigue. Howard Kleinfeld is a full-time wine enthusiast, part-time foodie, and first-time author. 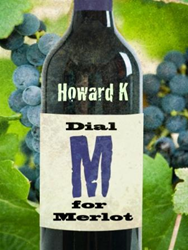 His new novel, “Dial M for Merlot,” http://www.DialMforMerlot.com, written under the pen name Howard K, follows a 30-year-old math whiz’s intoxicating journey of wine discovery. Kleinfeld is a longtime singer-songwriter whose compositions/productions for advertising, TV shows and indie films have earned him Emmy,Telly and Addy, awards.